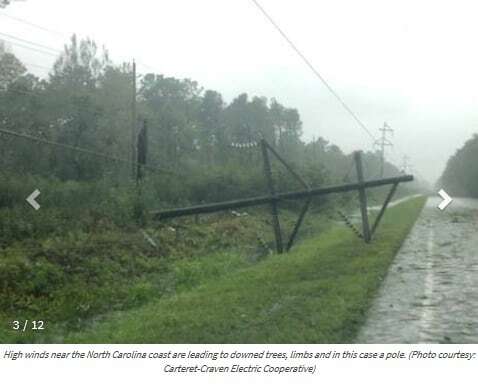 The photos above show fallen power lines in the Carteret-Craven Electric Cooperative area as signs of the hurricane’s strength today as it made landfall. Crews at Jones-Onslow EMC gather in their warehouse to discuss details of the restoration efforts. 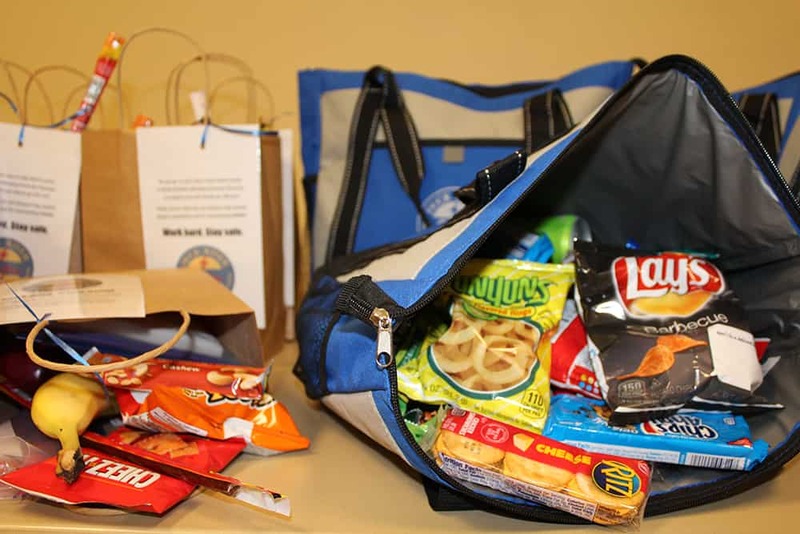 Employees at DREMC prepared snack sacks to send with our crews to help with their long day of travel and throughout the following days. Hurricane Florence slammed into the North Carolina coast Friday morning, leaving tens of thousands of electric cooperative members without power as entire electric distribution systems lost connections to transmission lines and power plants across the region. A nine-man crew and seven trucks from Duck River EMC will be leaving middle Tennessee at 5 a.m. Saturday for the Lumbee River EMC service area located in Red Springs, NC. As shown in the state map, Lumbee River EMC is in the southeastern region of North Carolina. Total co-op outages related to the storm edged close to 200,000 by midday. Co-ops in some areas are still not facing the worst of the storm’s high winds, and pelting rainfall had crews working to restore power. Others warned members to expect lengthy outages as line crews and other operations staff hunkered down in staging areas waiting for winds to subside. Cooperative-served communities directly in Florence’s path could face days or weeks of rebuilding their systems. As conditions continued to worsen along the North Carolina coast, all 40,000 of Carteret-Craven Electric Cooperative’s meters were out of service, with the co-op’s crews, contractors and mutual aid personnel sheltering in staging areas. Crews anywhere in the path of the storm could be forced to wait it out until still-building winds subside to under 35 sustained mph, due to safety concerns. Crews will not be able to deploy bucket trucks and are also at risk from falling trees and windblown debris. Electric cooperatives serve around nine million consumers in the Carolinas, Georgia and Virginia. Florence’s size and power could push hurricane-force winds in excess of 75 mph up to 100 miles inland and tropical storm-force winds of between 35 mph and 74 mph across the service territories of dozens of co-ops as far west as the Appalachian foothills. Forecasters have warned that Florence’s severe weather conditions are likely to last several days. Heavy rains could be measured by the foot in some areas, and widespread flooding and mudslides could occur as far west as the Ohio River Valley. Record rainfall in parts of the mid-Atlantic region this summer means trees, still heavy with leaves, are at risk. Stiff breezes along with more rainfall over saturated ground could weaken root systems, toppling trees into power lines and across rights of way, knocking out power. 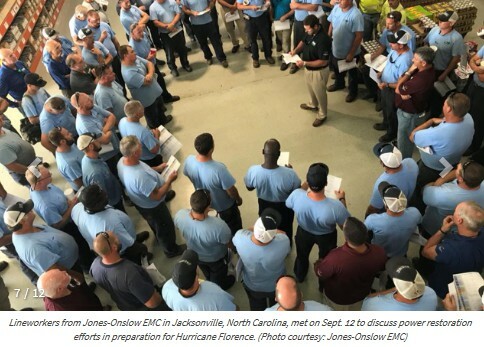 “For nearly a week, electric cooperatives have coordinated recovery and mutual assistance plans ahead of Hurricane Florence’s arrival, and are prepared to respond to extended outages around the clock as soon as weather conditions allow,” said NRECA CEO Jim Matheson. That massive mutual aid plan shifted into high gear on Thursday, even as the first major storm-related outages were being reported from coastal areas. 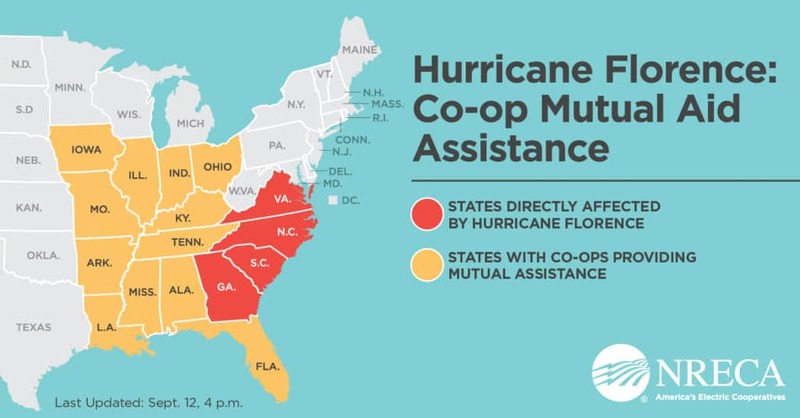 The effort not only involves co-ops from unaffected areas of the threatened states, but it’s also supported by hundreds of skilled line technicians, tree crews and operations support personnel from electric co-ops in a dozen states, primarily in the Midwest and mid-South states. From Tennessee alone, 140 electric cooperative line workers will be assisting hurricane-ravaged areas of North Carolina. Some crews are already in place and more are expected to arrive in hard-hit regions through the weekend, quickly feeding into the restoration flow wherever personnel and equipment can have the greatest impact.